Harnessing the power of the sun and creating light-harvesting or light-sensing devices requires a material that both absorbs light efficiently and converts the energy to highly mobile electrical current. Finding the ideal mix of properties in a single material is a challenge, so scientists have been experimenting with ways to combine different materials to create "hybrids" with enhanced features. In two just-published papers, scientists from the U.S. Department of Energy's Brookhaven National Laboratory, Stony Brook University, and the University of Nebraska describe one such approach that combines the excellent light-harvesting properties of quantum dots with the tunable electrical conductivity of a layered tin disulfide semiconductor. The hybrid material exhibited enhanced light-harvesting properties through the absorption of light by the quantum dots and their energy transfer to tin disulfide, both in laboratory tests and when incorporated into electronic devices. The research paves the way for using these materials in optoelectronic applications such as energy-harvesting photovoltaics, light sensors, and light emitting diodes (LEDs). According to Mircea Cotlet, the physical chemist who led this work at Brookhaven Lab's Center for Functional Nanomaterials (CFN), a DOE Office of Science User Facility, "Two-dimensional metal dichalcogenides like tin disulfide have some promising properties for solar energy conversion and photodetector applications, including a high surface-to-volume aspect ratio. But no semiconducting material has it all. These materials are very thin and they are poor light absorbers. So we were trying to mix them with other nanomaterials like light-absorbing quantum dots to improve their performance through energy transfer." One paper, just published in the journal ACS Nano, describes a fundamental study of the hybrid quantum dot/tin disulfide material by itself. 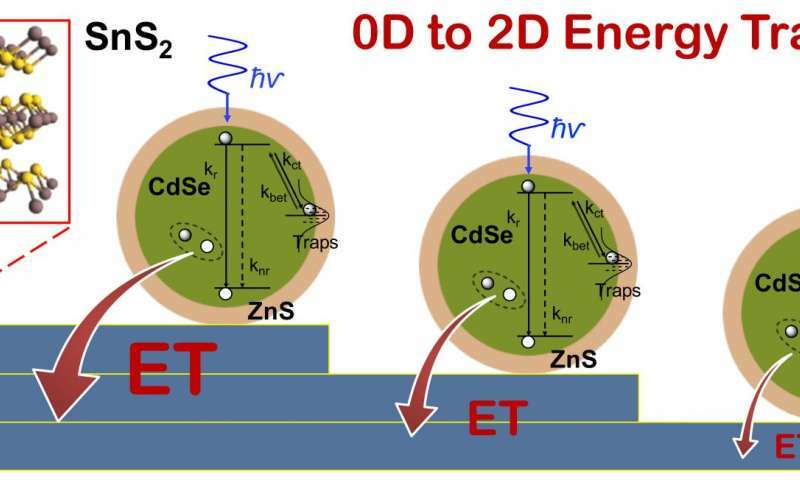 The work analyzes how light excites the quantum dots (made of a cadmium selenide core surrounded by a zinc sulfide shell), which then transfer the absorbed energy to layers of nearby tin disulfide. "We have come up with an interesting approach to discriminate energy transfer from charge transfer, two common types of interactions promoted by light in such hybrids," said Prahlad Routh, a graduate student from Stony Brook University working with Cotlet and co-first author of the ACS Nano paper. "We do this using single nanocrystal spectroscopy to look at how individual quantum dots blink when interacting with sheet-like tin disulfide. This straightforward method can assess whether components in such semiconducting hybrids interact either by energy or by charge transfer." The researchers found that the rate for non-radiative energy transfer from individual quantum dots to tin disulfide increases with an increasing number of tin disulfide layers. But performance in laboratory tests isn't enough to prove the merits of potential new materials. So the scientists incorporated the hybrid material into an electronic device, a photo-field-effect-transistor, a type of photon detector commonly used for light sensing applications. As described in a paper published online March 24 in Applied Physics Letters, the hybrid material dramatically enhanced the performance of the photo-field-effect transistors-resulting in a photocurrent response (conversion of light to electric current) that was 500 percent better than transistors made with the tin disulfide material alone. "This kind of energy transfer is a key process that enables photosynthesis in nature," said Chang-Yong Nam, a materials scientist at Center for Functional Nanomaterials and co-corresponding author of the APL paper. "Researchers have been trying to emulate this principle in light-harvesting electrical devices, but it has been difficult particularly for new material systems such as the tin disulfide we studied. Our device demonstrates the performance benefits realized by using both energy transfer processes and new low-dimensional materials." Cotlet concludes, "The idea of 'doping' two-dimensional layered materials with quantum dots to enhance their light absorbing properties shows promise for designing better solar cells and photodetectors." Nice work but the naming is just wrong. It's a molecule not a quantum dot. By the way, quantum dots don't exist.